I’m recovering from a cold, so last night I took some NyQuil and went to bed early. This morning I was still feeling a little sluggish and if it hadn’t been for an alert reader bringing this bit of news to my attention, I’m not sure I would have noticed until at least my the third cup of coffee. So thanks Bob for your note! Take an American Airlines Facebook survey for 500 free AAdvantage Miles and a chance to win up to 50,000 more! We want your feedback! Take our Miles for Your Thoughts survey and earn 500 AAdvantage bonus miles, plus be entered for a chance to win 50,000 AAdvantage miles. 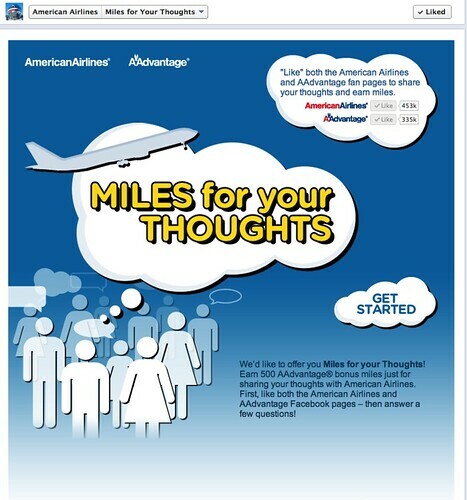 If you’ve already “Liked” both American Airlines and AAdvantage, then just click “Get Started”. Take the survey. Your 500 miles will be deposited in 6-8 weeks and you’ll automatically be entered in a drawing to win 25,000 to 50,000 AAdvantage Miles. All entries must be received by 10:59 p.m. CT on December 17, 2012.